Satiric, historical deconstruction of The Steel Butterfly, presented as a slide show lecture with droll, authentic, commentary by a Filipino tour guide. In ninety, informatively entertaining minutes, Filipino performer Carlos Celdran, an “historical walking tour guide,” delivers a lively slide show lecture chronicling the life, impact, and cultural significance of Imelda Marcos in Livin’ La Vida Imelda. The stage is made up to look like a cluttered living room with a desk, couch, wheelie desk chair, and several bowler hats strewn around that periodically get worn later on. On a large screen, a series of slides with short descriptions, traces the history of The Philippines from Magellan’s landing there in 1521, to the present, with The Marcoses in between before the show starts. 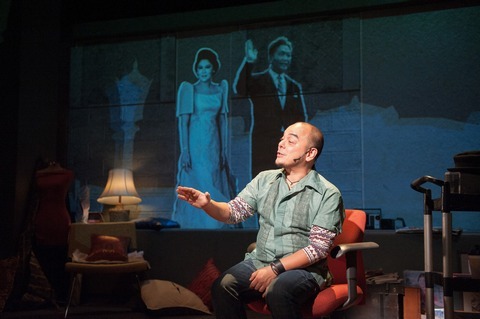 The personable and animated Mr. Celdran who conceived and wrote the piece, enters, and with a measured, often ironic delivery proceeds to directly lecture the audience about Imelda Marcos, accompanied by expertly selected and projected illustrative slides on the subject The unison of the two, combined with inspired stage effects, are entertaining, as well as thought provoking. He creates an intriguing, cryptic, Everyman character, personally detached from the events, which may or may not be imparting the absolute truth. He very soon mentions the infamous 1,500 pairs shoes discovered in The Marcoses’ palace following their exile after being over thrown on 1986. Also discovered in the kitchen area were cases and cases of a mayonnaise spread. Imelda grow up in poverty and never got over it. As a child she ate dry bread without anything to put on it and that hunger fuelled her life, leading to notorious excesses. The mayonnaise, more than the shoes, is a symbolic Rosebud (the mysterious touchstone of Citizen Kane) to decipher her motivations. The unfamiliar and familiar anecdotes are recounted along with generally unknown factoids. Imelda’s coming in second in the rigged Miss Manila pageant and then shaming the mayor into changing the decision to a tie, gets a new twist due to speculation that she became pregnant with his child. She married Ferdinand Marcos a week and half after they met, and gave birth later that year. Years later she fantastically tried to fix up this daughter with Prince Charles. She intensely participated in her husband’s political campaigns, and became accustomed to sleeping only two hours a day, sitting up so as not to mess her hair. In 1959, she had a nervous breakdown, and spent a year in New York City, first at Bellevue Hospital, and then in psychotherapy, before returning to The Philippines. There is a wild sequence where Marcos’ reportedly undersized genitalia is analyzed, concluding that was the key to their downfall. This obsessive situation led to him taking steroids to build up his body to compensate for this, and which eventually led to his deteriorating health that enabled his opponents to force him out. There is a sober account of the many tortures, disappearances, and executions that preceded this under martial law. Throughout, there is Imelda in comical dream world, behaving more and more like a delusional monarch. Her numerous outrageously lavish public buildings projects, incongruous, for so poor a nation, are hilariously described. Reenacted also are the jet set era, consorting with world leaders, and the Studio 54 days. Mr. Celdran weaves these and many other tales and observations into an compelling event that alternates between inciting laughter and thoughtful silence. With his well-honed recitation, personal charm, fluid physicality, and native perspective, he is the perfect conduit for this material. Director Ralph B. Peña’s staging, has Celdran purposefully all over the stage. Nick Francone’s set design presents a detailed and whimsical space for the character giving the lecture. Becky Bodurtha’s costumes simply and artfully convey the authentic look. The collaboration of lighting designer Yi Zhao, sound designer Fabian Obispo, and production designer Hannah Wasileski theatrically enhances the show further, giving it at times quite exciting visual and aural dimensions. Typhoons, rallies, riots, and journeys around the world, are inventively simulated. The environmental musical Here Lies Love presented a kaleidoscopic take on the subject, and this show with its contained, satirical, documentary approach is an equally successful achievement of historical storytelling. Imelda Marcos was a flamboyant, enduring, and memorable celebrity for a long span of time. Now aged, and out of the limelight, she remains a fascinating figure for many, and Livin’ La Vida Imelda vividly depicts her, in all her complex glory. Clever idea to combine the tales of the Arabian Nights and a contemporary Palestinian/Jewish story in a new musical becomes muddled as it also reaches for a bleak future.